Key difference: Kickboxing and MMA are two different styles of martial arts. In kickboxing the primary moves are kicking and punching, and some clinching. Whereas, the moves in MMA are much more diverse; it includes kicking, punching, clinching, grappling, throwing, etc. 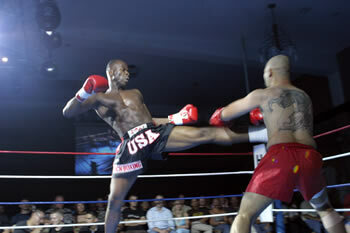 Kickboxing and MMA are two different styles of martial arts. MMA stands for mixed martial arts, which indicates that it is a mixture of various different martial art techniques. It can technically be said that kickboxing is a type of mixed martial art, as like MMA it also blends a few different styles together. However, in practicality the two have developed into two distinct styles. The term kickboxing can be used in two contexts. One is where it can refer to any stand up combat sport which includes both punching and kicking. This includes Savate, Muay Thai, Khmer Boxing, Indian boxing, Burmese boxing, Sanda, and certain styles of Karate, especially full contact karate. However, its second context is narrower. Here it is used specifically to refer to Japanese Kickboxing, Dutch Kickboxing, and American Kickboxing. These are the styles that are inherently known and referred to collectively as kickboxing. The terms and rules of kickboxing are quite varied. In America, kickboxing and full contact karate are stylistically almost the same. Here, only strikes using punches and higher kicks are allowed. Whereas, in its other forms, low kicks, knee strikes, elbows, and grappling maneuvers are allowed. MMA, on the other hand, was originally promoted as a competition to find the most effective martial arts for real unarmed combat. This included fighters with various different fighting styles to be pitted against each other. Eventually, these various fighting styles melded together to form what is now popularly known as Mixed Martial Arts (MMA). MMA is often considered to a violent sport, if a sport at all. Many countries don’t actually consider MMA as a sport; instead they consider it as organized street fighting matches. MMA often gets a bad rap due to its no-holds-barred fighting style. In MMA, the competitors often used various different moves from various different fighting styles. While the term, Mixed Martial Arts was first used in 1993, the style of fighting it was used to describe dates back before that. In fact, it dates back all the way to Ancient Greece, where it was known as Pankration, an ancient Olympic combat sport that utilized a combination of grappling and striking skills similar to the modern MMA. This sport then passed down to the Romans, and then further down. Today, MMA is generally considered as a regulated sporting event complete with weight classes, matches with time limits, protection for the players such as introduction of gloves, as well as rules and guidelines about the kinds of moves allowed and the areas that can be hit, for example, no elbow hits to the head. Of course, these rules may differ depending on the organizer of the MMA event, however most of the rules are considered as consensus. Certain differences in the fighting styles between Kickboxing and MMA include the fact that in MMA the stance of the fighter is usually lower than in Kickboxing. The lower stance helps to defend against takedowns or to take the opponent down themselves. In kickboxing, the stance is typically much more upright with a little more weight on the back leg. This helps to defend against low-kicks to the upper leg, as well as to throw kicks. Also, in kickboxing the primary moves are kicking and punching, and some clinching. Whereas, the moves in MMA are much more diverse; it includes kicking, punching, clinching, grappling, throwing, etc. Some forms of MMA also allow knee cuts and elbow strikes, whereas others do not. Striking using kicks and punches. All including fighting grappling, punching, kicking, and knees. Like boxing and karate, kickboxing has strict rules in place about the kind of moves allowed, the places that can be hit, rules for matches and points, etc. Originally, MMA had no rules. However, rules were introduced to protect the fighters and to lose the illegal fight image. Though it still has fewer rules as compared to other older fighting styles. Ideally in full protection kit made of gloves, mouth guard, groin guard, shin and foot pad. Typically only gloves and mouth-guard. Often groin guard are also required. Kickboxers use larger gloves that cover the fingers and palm. MMA fighters wear smaller gloves with open fingers and palms. Usually in Cages, sometimes in Rings, and also on streets.